Reactions get quicker with practice. So your ability to balance gets better too, because you react more quickly to shifts of balance. But you don't make big improvements in a stable kayak on flat water. If you want to stretch yourself, try something a little less stable, like a down-river racer, a sprint kayak or a surf ski, or one of the narrower sea kayaks. 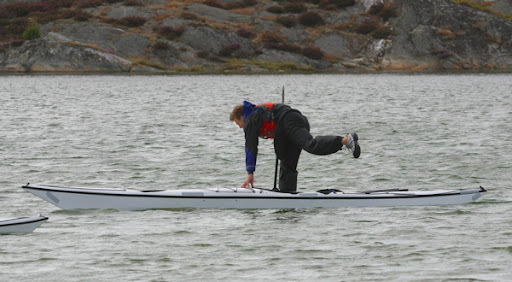 Try a tippier kayak in choppy water. Try standing in your kayak. 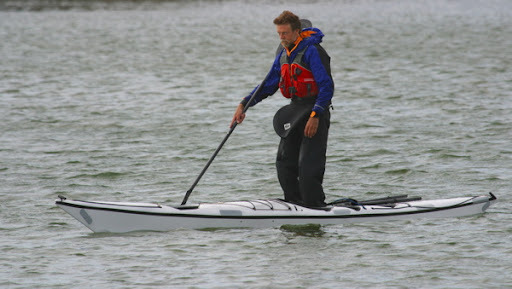 Ultimately being able to balance a kayak in a relaxed way is less to do with tight thigh-braces and a lot of grip, it's more about letting go completely with your knees, relaxing your body, maintaining power on your blade and keeping contact with your kayak through your feet and seat. Keep your weight focussed on a narrow line down the center of your kayak, and let your weight shift sideways from your middle while your head stays above your seat. If you try to grip tightly in a tippy kayak you'll wobble like crazy. Keep your knees together, relax, and you'll balance more easily.